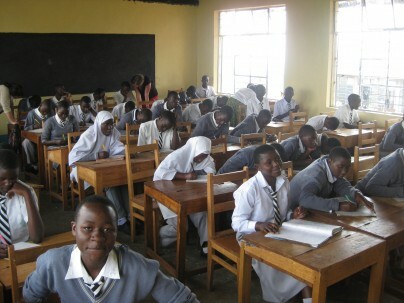 Over the past 2 weeks the Tanzania semester students Carly, Isabel, and Sarah have been volunteering 6 hours a week; teaching English at Kayanga Secondary School. The school is located on the outskirts of Kayanga overlooking the mile high view of the valley below. It takes the students approximately 10-15 minutes to walk the 1200 meters downhill from Misha Guest House to the school. The trek back to Misha is demanding but as I always say what doesn’t kill you only makes you stronger. The school is home to 555 students, 10 full-time, and 3 unpaid part-timers. The classrooms are packed with students between the ages of 13-23. Our students have been teaching English to the Form 3 students who range from 14-19 years of age. The work is quite challenging and demands much attention and I have been able to exercise my expertise in assisting with planning and preparation. I have also been able to observe and reflect with the students on methodology in the classroom as well as classroom management tips and skills. The “student teachers” are getting a great opportunity to practice their skills and their students are benefiting greatly from learning from native speakers. The students have been able to take full advantage of a new classroom which has just been finished. A donation by Amizade this past summer allowed for the completion of the classroom. The school patron/ counselor/ English teacher; Mr. Justin Osward couldn’t express his gratitude more clearly. With the addition of this classroom the school has been able to expand for the ever increasing student enrollment. Caitlin and I feel very happy to be working for an organization that has generously supported the local community. Many thanks to Amizade from the students and faculty at Kayanga Secondary! Keep the blogs coming, I really enjoyed reading about the student involvement. Looking forward to the next one. Yes, please keep the blogs coming! Love to hear about the girls making a difference. Thanks and do keep blogs coming. Can you post some pictures? I studied at Kayanga secondary school in my secondary level from 2006 t0 2009. I was always the best academically from form class one to 14 class-high school. Now I am studying Bachelor of Law at Mzumbe University, the best University in Tanzania. My mobile number is +255 758 33 40 40.